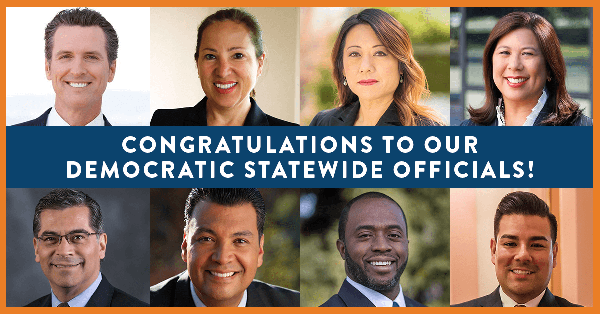 Sign our card to congratulate Governor Newsom and our Democratic statewide office holders. Yesterday was a historic day for California! Gavin Newsom was sworn in as governor, alongside the seven additional Democrats who won every single statewide office last fall. That huge victory is thanks to you, and Governor Newsom is already hard at work fighting for our progressive values — including taking action to lower prescription drug prices and working to move our state closer towards healthcare for all. Will you sign our card today to congratulate Governor Newsom and the rest of our Democratic statewide office holders — and urge them to keep up the fight for our progressive values? Governor Newsom will be fighting for our values alongside one of the most diverse sets of statewide office holders in history. Three women — Lieutenant Governor Eleni Kounalakis, Treasurer Fiona Ma, Controller Betty Yee — hold statewide office together for the first time in history, two of them Asian-American. They’ll be fighting alongside Attorney General Xavier Becerra, Secretary of State Alex Padilla, State Superintendent of Public Instruction Tony Thurmond, and Insurance Commissioner Ricardo Lara, four Latino Californians who are similarly making history by serving together. Thurmond is the first Afro-Latino to hold the position of California’s State Superintendent of Public Instruction. And Ricardo Lara made history twice over yesterday, as the first openly LGBTQ Californian to be elected to statewide office! We are so proud to have this inspiring and diverse group of elected officials working for us and our values. Click here to sign our e-card congratulating them and urging them to keep up the fight! Contributions or gifts to California Democratic Party are not tax deductible.